the action of dividing or splitting something into two or more parts. 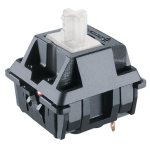 RGB LEDs have firmly placed themselves as the most popular things to live behind your keycaps. But what if we split them up? Leave clean white light on top and move color to the edges with the MK Fission. Equipped with Cherry MX switches, a sleek aluminum frame, and Double-Shot legends; the Fission offers a unique balance of style, beauty, and function. Dimensions 17.25" x 5.50" x 1.50"
8 Months later and still I consider this one of the best keyboards I've owned. Some people may want more LEDs or color changing backlights however, I find this simple yet exciting with simple backlight and an aura glow in the back. The caps show no sign of wear considering I play an avg of 40 hours of fps/moba gaming/ week. First mechanical Keyboard, and I love it. This is my first mechanical keyboard and I love it. Absolutely would recommend for a first time keyboard. This is my fist mechanical keyboard so I do not have anything else to compare this to. However, I am loving this board so far! Overall, this keyboard is great quality and looks and feels nice. 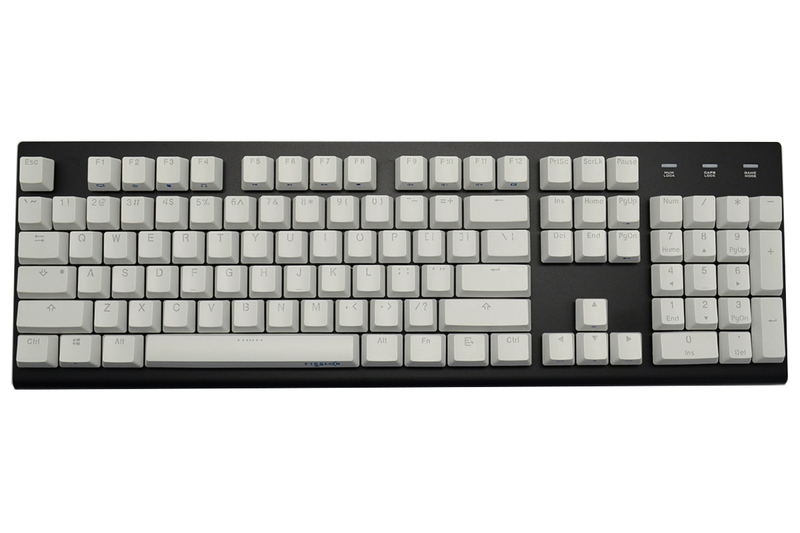 It is a great starter keyboard or just a nice board to add to your collection. I've had this keyboard for a little under a week and have very impressed by it. The aluminum plate is very sturdy. The lighting on the keyboard is very clean looking and when turned off you would never know the keyboard had LED lighting. The cable is pretty good quality and has no visible writing on it and after a week in unfurled nicely. It came with a little dirt or a water smudge on the paint that wiped off. The key caps also seem like they could've been a little more high quality. A few key caps had these little cuts on the side of them and the keys themselves have a very sandy feeling to them. Overall for the price I think this is the best keyboard for the money. It would be nice if the quality control was a little better. Update 30 September 2017: still the best keyboard I have ever used. Update 18 April 2017: after two months of use this is still the best mechanical I have ever used. Wow. This is a lot of keyboard for a more than decent price. As I type on it now, just having received it today, I can't give a detailed long impression. I can only provide my initial perceptions and those are beyond amazing. 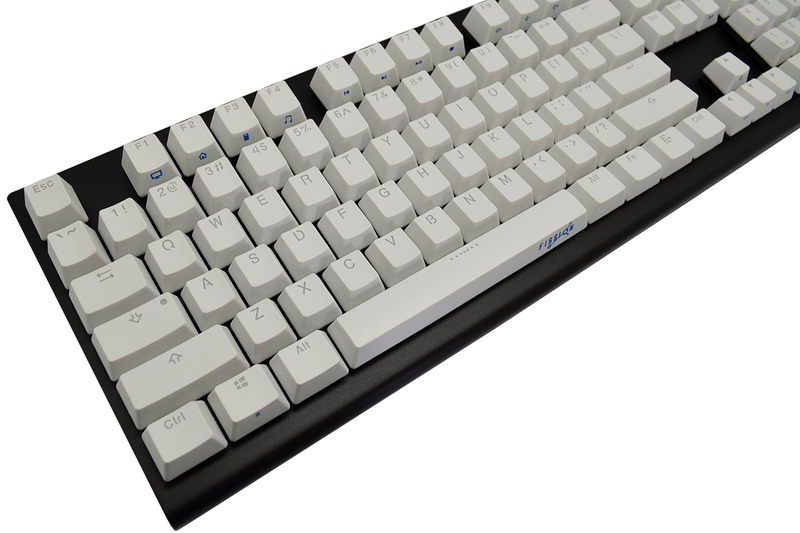 Firstly, I got the white-keyed version with Cherry MX Clears. The switch type is irrelevant to the keyboard since there are so many options and they are all so personal. The key color, however, is quite relevant. In my current hindsight, I might have chosen the black-colored keycaps only because this keyboard is destined to be my work keyboard and the white keys certainly stand out. I love them. In my future's hindsight, I am sure I will not regret my decision to possess such a boldly colored keyboard. 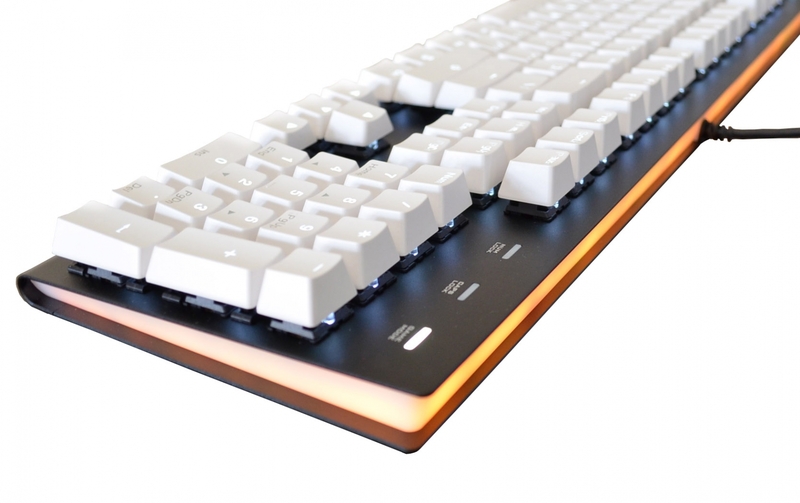 The contrast of the white keys on the black metal backplate is stark and beautiful. The keycaps are quite starkly lit if you chose to use the light. VERY bright white light on white keycaps is actually astoundingly beautiful as well. It is incredible how much contrast they managed to produce with white backlighting on white keys. As mentioned in some reviews of this keyboard, there are some keycaps where the lighting is not perfectly even. This is due to the extremely high-quality caps, believe it or not! However, that is still a negative aspect. The number pad experiences the largest gap in lighting: the Home, End, Ins, Del, NumPadArrows, PgUp, and PgDn legend writing is not lit much at all. This could be by design; I know I NEVER use those features on the number pad, and as I state later, the welcome default of NumLock ON means I likely never will. They are double-shot caps and the feel about as sturdy as they come. Unless it is due to discoloration of the white caps, I doubt I will ever need to replace these keycaps. Unfortunately, I can't give a valuable perspective on the keycaps based on their longevity because this is a brand-new keyboard release. All I can say is that they feel like the thickest I have ever used. However, I can continue to comment on the legends: I do believe that placing legends side-by-side on the dual-symbol keys is the best approach for lighting AND readability. Oft I have been led astray by a %u201Cgaming%u201D keyboard swapping which one is on top. (Razer) We read left to right %u2013 it is about time our keys reflect that. The left symbol is the output without %u201Cshifting%u201D and the right symbol is the %u201Cshifted%u201D symbol. Simple and consistent. If you view this as a negative you are being silly. I only mention this because others have. It really is a non-feature and non-con. But the Fn/media-legends are different. They are very important to be able to see and discern since they are different from keyboard to keyboard and you might not memorize them as you do the location of the tilde. Of note, they are not lit. Upon testing, the media keys on the Function row are barely visible without room-lighting. Your displays will likely light the keys well enough however; this may vary based on keycap color %u2013 since my white caps might reflect my monitors lighting much more aggressively. On a final note, the Fission logo is a bit obtrusive to the aesthetic of the keyboard. I hope that they subdue the logos of their future keyboards. Also of a minor note is that this keyboard does use Cherry MX leveling mechanisms for the stabilized keys. I always find this a plus. WOW! This thing is a lethal weapon! SOLID metal chassis. Seriously? This is a lot of keyboard for not so much money! 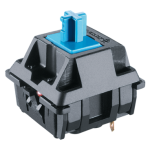 Of course, the key switches are Cherry MX, so those are high quality, too. Time will tell if the interior is of superb quality, but given the lack of undercutting on the exterior, I would highly doubt they skimped on the internals. The rubber feet are very solid and of superb quality. The kickstand-risers also have rubber feet that actually work well, unlike some other keyboards. It seems they actually designed the risers starting with the rubber feet and then tried finding the best way to attach them to the board, instead of adding rubber as a useless afterthought. Now for the CON of the build quality: the cord. I have almost no doubt that the cord will last for a long time %u2013 but I also have almost no doubt that it will be the reason I am eventually forced to replace this god among keyboards. Not having a detachable cord is a HUGE issue nowadays since it is the leading cause, in my experience, of good peripherals%u2019 failures. I would have even rather it didn%u2019t come with any cord at all, instead just having a Micro-USB or Type-C port. Of course, they couldn%u2019t sell it without a cord, but I hope that they listen to these minor complaints before designing their next keyboard. This is the only feature I feel they held back. I know that someone designing this beauty wanted it but was told it was too costly. This downside shouldn%u2019t put many people off. It should only deter you if you actually plan on moving the keyboard more than once a week %u2013 for instance if you plan on carrying it back and forth to work every day. I am sure the cable will hold up, if cared for, if you merely go to LAN parties every weekend. KEEP IN MIND: If you take good care of your keyboard, the cord will never spontaneously break. It isn%u2019t the actual cord%u2019s fault if it breaks. I expect this board to last me at least a decade of software development. As mentioned earlier, this keyboard does come with media key legends place without lighting but in an easy to read location. The Fn-key itself replaces the right Windows/Os key. This might be a very noticeable downside if you often use the right Windows key for the various hotkeys it can be used for, but I imagine most won%u2019t even notice the loss. As for the media and functionality keys themselves, I have tested them all and they seem to all work great. The Browser and Media Program buttons launch your defaults, which you will have to change in Windows if you don%u2019t like them. There is no proprietary software to change them with. 1) NumLock and N-Key Rollover (Game Mode) are ON by default. 2) CapsLock, ScrollLock, and WindowsLock are OFF by default. 3) YOUR SETTINGS ARE SAVED even when they board has no power. This means that the most desirable traits of the keyboard should be correctly set when you first pull it from the box. Of note is that they call N-Key Rollover %u201CGame Mode%u201D. This is silly, and there is a light always on next to your other toggle indicators the shows N-Key Rollover is enabled %u2013 because why would you ever disable it? Also noteworthy is that there is no ScrLk indicator! WHAT!?!? This is a huge blunder %u2013 what will I ever do if it is enabled and I don%u2019t know? HOW WILL I KNOW!?!?! All kidding aside, this is actually a pretty real downside. In some applications there is a real difference in how they work with Scroll Lock on or off, mainly Excel, and some people may accidentally enable Scroll Lock and not be able to figure out why their program is behaving abnormally. As far as the firmware goes, it all seems to work as I would want it to; and as anyone really should want it to. This is about the best $120 keyboard you can buy. It is minimalist if you want it to be, and it is shiny and bright if you lust it to be. The construction is as sturdy as a keyboard can be made %u2013 top-notch in almost all regards except the lack of a removable, and an unbraided one at that, cable. I whole-heartedly recommend this keyboard to anyone who isn%u2019t traveling with it every day. It is produced by one of the largest distributors of mechanical keyboards in the United States, and its price to quality to feature ratio is far superior to any other keyboard I have witnessed. If you like the aesthetics of this board, you needn%u2019t fear anything at all. It will live up to your demands and more. Great construction quality. Well priced. Keys feel and look great. Nice, clean look to it all. Light functions work very well and are cool looking. I can't yet speak on the durability but they have a very solid warranty to ease my worries. I love this keyboard and plan on getting another for home when I can. 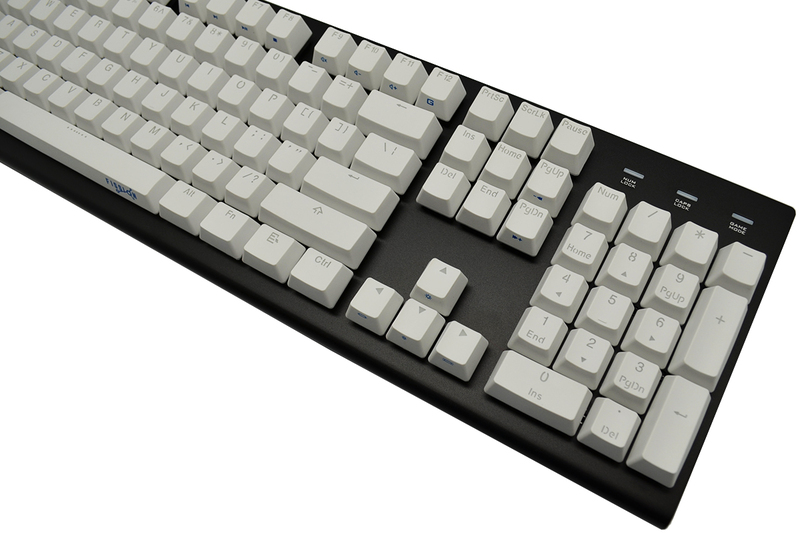 High build quality full sized keyboard with cherry mx clear switches at a reasonable price point. Exactly what I was looking for. Thanks MK. Excellent keyboard for the price. It's extremely solid with well done lighting effects. I like the design a lot, and it's just an exceptionally well built keyboard, especially given the reasonable price. Hands down my favorite keyboard. Great build quality, lighting effects are very smooth, lots of FN-key customizable options for lighting, and great keycaps. Highly recommend. I've been using this keyboard for right at a month now. I've had no issues at all as of this time. However, should any issue arise, MK offers a 2 year warranty on all MK-brand keyboards. The RGB surround is very nice for accent lighting, but the main reason for choosing this keyboard is the white back lighting. There are an over abundance of RGB backlit keyboards now that's it's hard to find a high quality white-only backlit option. The RGB "White" is either too blue or too pink - neither are attractive. With this, it's white and nothing but white. I've have GMK, SA, DSA, and Cherry-ish profile keycaps on this keyboard and none have any issues. Not that the stock keycaps are bad, I just prefer non-OEM profile. I 100% recommend this keyboard and rate it 5/5.